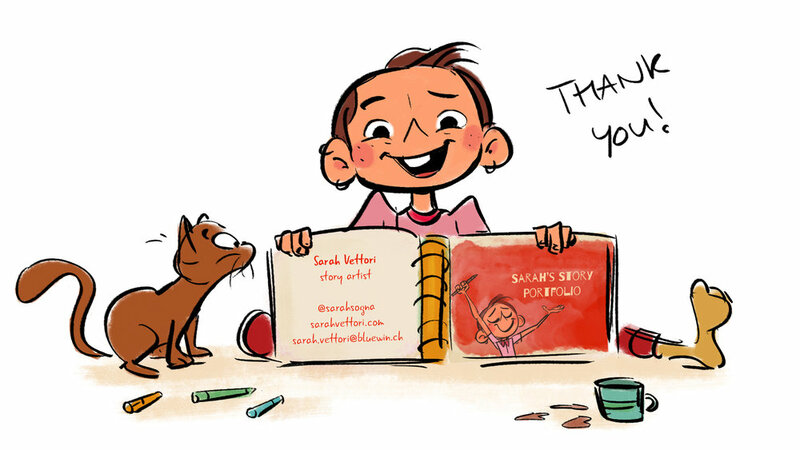 Thanks for visiting my story portfolio 2019! Please find below my storyboards, beat boards, life and gesture drawings and personal art. If you would like to see my production boards, please connect with me directly. Are you in need of a story artist? Drop me a line, I am happy to help. :-) Thank you! A story about an old woman remembering a pivotal moment in her life. Keep scrolling for the next story! Click on each first drawing to enlarge it and easily swipe through the story. A story about a sleepwalking tightrope walker that suddenly wakes up! Loosely based on a true story – in human form ;) Two grandmothers fighting for the affection of their grandchild! A young Buddhist monk has a hard time to concentrate during meditation because of all the visiting tourists with their gadgets disturbing the quiet of the monastery. When an old monk tells him about a magic flower that brought enlightenment to Buddha, he goes on a journey full of adventures to find it in the hopes it helps him to learn true meditation. When he finally discovers the secret place, he is devastated to find out the flower has long been gone. But there, far away from society and its disturbing noise, surrounded only by breathtaking nature, he for once is able to clear his thoughts and… begins to float like the elders. Returning to the monastery the old monk reveals him the true magic: It was never about a flower, but the true key to meditation, to find inner peace, lies within yourself. Our little monk has now no problem finding the right state of mind and can meditate everywhere – no matter what buzzing cellphones and talking people are around. If you like to see more of my comics, visit my blog or Instagram. Usually I post 1 to 3 new comics a week. :) Thanks!